(A) In which market structure do these firms operate? Explain. You should know by now that the market structure is an oligopoly. There are only two firms (Rankin & Roadway) and they are mutually interdependent. (B) If Roadway chooses an early departure, which departure time is better for Rankin wheels. So before you start to answer this question you should make a chart. Here is the word chart for this problem, if you do it the same way every time you will get it correct. 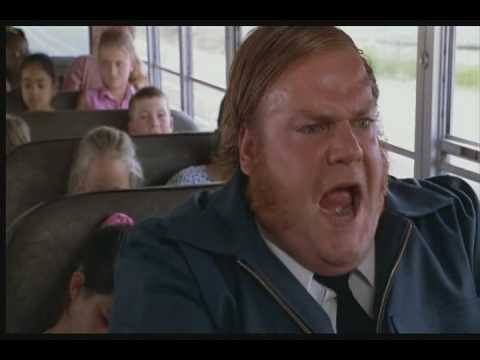 Answer – If Roadway chooses an early departure then Rankin should go early. (C) Identify the dominant strategy for Roadway. Notice the shaded area for Roadway. No matter what Rankin does Roadway will/should go Early. This means that Roadway has a dominant strategy. (D) Is choosing an early departure a dominant strategy for Rankin wheels? Explain. NO, an early strategy is not a dominant strategy for Rankin because if Roadway goes late then Rankin should go late because $800 > $650. 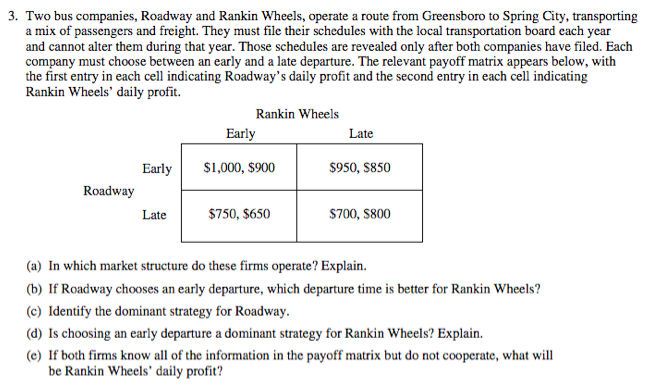 (E) If both firms know all of the information in the payoff matrix, but do not cooperate, what will be Rankin wheels daily profit? Understand that Roadway is going to go early no matter, so then Rankin will choose early also as it has the highest payoff of $900. For this question, even if they had cooperated they still would have chosen the same quadrant. Welker does it so well.